Big Hugs Elmo $39.99 (Retail $59.99) & Free Shipping! If your looking for a deal on the Big Hugs Elmo, hurry over to Amazon now and get it for just $39.99 (Retail $59.99) & Free Shipping. My daughter got this for her birthday this year and loves it. If you have a Thomas & Friends fan, hurry over to Amazon now and get the Thomas & Friends Take-n-play Sir Handel At Great Waterton for only $9.99 (Retail $24.99). Shipping is Free with Amazon Prime or orders $35 or more! Hurry over to Amazon and get The Wolverine (Blu-ray / DVD + DigitalHD) for only $17.99 (Retail $39.99). Shipping is Free with Amazon Prime or orders $35 or more. Today ONLY Target is offering several Gift Card Deals! This weekend, DiscountMags is having a Customer Appreciation Sale which means a great deal for all of us. You can get 2 Magazine Subscriptions for only $8. You can order additional magazines for only $3.99 per year! I counted 64 magazines you can pick from! Go here to get in on this great deal! 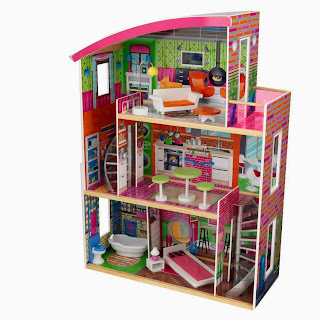 Today ONLY, Kids Woot is offering this KidKraft Designer Dollhouse for ONLY $89.99 (Retail $164.99)! Right now iTunes App Store is offering Pac-Man for $0.99 (Value $7.99). Today ONLY Best Buy is offering Call Of Duty Ghosts for Xbox 360, PS3 or Wii U for only $38.99 (Retail $59.99). This is one of the best prices I've seen. Head over and grab this Lodge Logic Cast Iron 5 Quart Double Dutch Oven for $29.99 (Retail $50). PediaSure 6 pk. or Sidekicks 6-8 pk.